Architecture and engineering firm LEO A DALY designed an underground pedestrian tunnel at Minnesota State University in Mankato that provides a sheltered passage for students and faculty to use during harsh weather. The green-roofed design, dubbed The Connection, has been awarded the Engineering Excellence Award by The American Council of Engineering Companies (ACEC) of Minnesota. 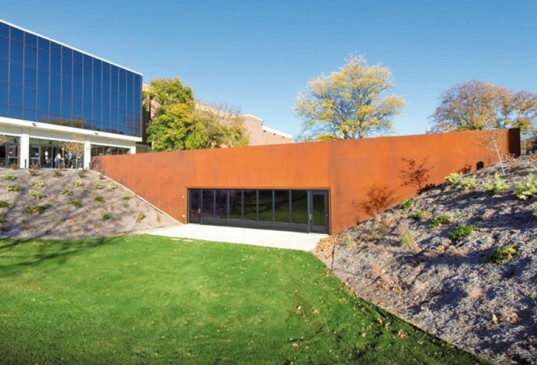 The 140-foot long, 12-foot wide underground structure connects Minnesota State Mankato’s Memorial Library and the recently renovated Centennial Student Union (CSU), and also creates an outdoor amphitheater that is nestled into the existing landscape. A curtain wall allows natural light to penetrate the interior, while most of The Connection’s external walls are made from weathering steel. The steel creates a sense of connection between the tunnel structure and a steel sculpture located at the east end of the site. The structure is topped by a green roof to help insulate against the chilly Minnesota winters. In order to create the “folded” curtain-wall design, the architects and engineers designed a mat structure and steel framing which runs the length of the tunnel and supports the cast-in-place concrete form which was used to install the corrugated steel panels. It also creates an outdoor amphitheater that is nestled into the existing landscape. 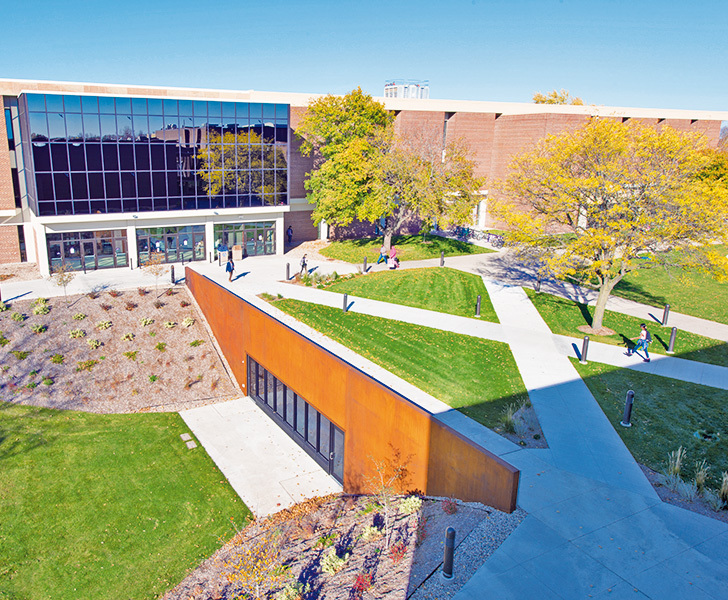 The 140-foot long, 12-foot wide underground structure connects Minnesota State Mankato’s Memorial Library and the recently renovated Centennial Student Union (CSU). A curtain wall allows natural light to penetrate the interior, while most of The Connection's external walls are made from weathering steel. The steel creates a connection between the structure and a steel sculpture located at the east end of the site. In order to create the "folded" curtain-wall design, the architects and engineers designed a mat structure and steel framing which runs the length of the tunnel. It supports the cast-in-place concrete form which was used to install the corrugated steel panels.